The for-profit education industry makes huge profits taking government money and lending it to students, most of whom will never get a degree. And the beauty is that when those poor suckers take the loans and can't repay them, that's the government's problem, not the "education" company's. Meanwhile, at least one for-profit educator hires sales people to push this money onto the weak -- including a dying woman who wouldn't live long enough to complete a single course-- and when sales people don't meet their quotas, it cuts their pay to force them to leave. For-profit education gets $26.5 billion in loans through a government program called Title IV. Thanks to a loosening of regulations under George W. Bush, the industry has grown at a 26.4% compound annual rate over the past five years, while earning a five-year average return on equity of 33.5%. The change in regulations permitted the for-profit education industry to call potential customers an unlimited number of times to try to persuade them to sign up for their programs. Moreover, although the regulations prohibit for-profit education companies from paying their sales people based on the number of deals they close, the industry has found an effective way around this restriction. San Diego-based Bridgepoint Education (BPI) pays its sales people $19 an hour, about $42,000 a year. It requires those sales people to update their deal closure statistics several times a day -- putting enormous pressure on them to bring in new customers -- regardless of whether the prospective students are suited for the program or likely to pay back the money. These sales people are responsible for getting customers to sign up for the loans and to attend one class -- that typically lasts six weeks. After that, the for-profit education companies devote very few resources to making sure these students complete their program. I learned these and other details from a sales person -- known as an enrollment adviser -- at one of Bridgepoint's operating subsidiaries who emailed me after reading my June 4th post on the industry. My source told me that Bridgepoint enrollment advisers usually last only six months -- annual sales turnover is about 60% -- and if they don't meet their quotas, the company cuts their pay by $15,000. The enrollment advisers need to enroll 20 to 28 students over six months to keep their salaries. My source also mentioned that the company prefers not to out-and-out fire the sales people, because that would require it to pay into unemployment. Instead, it drives them to quit by cutting their pay so much that they can't afford to stay. A Bridgepoint spokeswoman said in an e-mail that she was unable to obtain comment on these allegations "from any member of the executive team as they are all on business travel." Bridgepoint's filings with the Securities and Exchange Commission suggest that the company is being investigated by the Department of Education's Office of Inspector General for possible violations of enrollment procedures. Most recently Bridgepoint issued a press release that claims the Inspector General had yet to issue its final report because Bridgepoint hadn't provided the OIG sufficient information about whether it pays enrollment specialists based on quotas. Meanwhile, Bridgepoint has achieved something I have never seen in decades of analyzing financial statements -- it got the SEC to agree for it not to disclose certain information. Only the SEC and Bridgepoint executives know what Bridgepoint is hiding from investors. Bridgepoint enrollment advisers -- sales people -- receive lists of 300 to 500 people each day that they are supposed to call. My source told me a shocking story about one of these potential customers who called the company on a Friday because she was moving into a hospice -- where people who are about to die go to spend their last days -- and wanted to take a course on end-of-life issues to keep her mind busy. The following Monday, the enrollment adviser followed up with the woman in the hospice, who had since realized that because she was terminally ill, she wouldn't be able to complete the course or repay the loan to take it. My source said that the enrollment adviser decided that Bridgepoint ought not to keep harassing this dying woman to encourage her to sign up for the course, so the sales person blocked her number in Bridgepoint's system. When the enrollment adviser's manager found out about this, the manager issued a reprimand and demanded that the enrollment adviser call this woman and get her to enroll and complete her first class. Where does Bridgepoint get the list of names that it gives the sales people to call? My source claims that it hires people to call up specific regions of the country with large populations of different ethnic groups and relatively low income levels. The marketers call people in those regions and ask them if they would ever consider going back to school. These random people are then entered into the system for the sales staff to call. My source says that 70% of the people she calls from the list claim they have never been interested in a course. The key to Bridgepoint's profit is that the government makes $120,000 available to lend to every American that can be put towards their education. If Bridgepoint can get students to take the loans and complete one six-week course, the government will pay the loan amount directly to Bridgepoint. If the student can't repay the loan, the student has to settle up with the government -- Bridgepoint is out of the picture. Bridgepoint's staffing numbers are consistent with this economic model. According to my source, the University of the Rockies, a Bridgepoint subsidiary, has 64 enrollment advisers and only six so-called retention advisers, who encourage students to stick with the program until they complete their degree or to at least sign up for more courses. The dropout rate is extremely high in this industry. At Apollo Group's (APOL) University of Phoenix subsidiary -- with an enrollment of 400,000, it's the nation's largest for-profit university -- only 18% of students get their degrees in six years. The number drops to 6% at some campuses, and among online students it falls even further to a scant 4%. 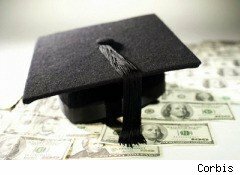 The many dropouts default on loans "as big as $100,000 for incomplete bachelor's degrees and up to $200,000 for advanced degrees," according to Business Insider. One of my favorite concepts in business is the Loyalty Effect -- an idea coined by Fred Reicheld, a former Bain & Co. partner. Basically, it's far more profitable to get and keep a customer for a long time than to let customers get so frustrated that they leave and force you to go out and get new ones. Achieving customer loyalty requires companies to treat employees well so they want to give customers better value. The for-profit education industry takes the Loyalty Effect and tips it upside down. It preys on society's weakest and hires desperate sales people whose short-lived jobs require them to force people to borrow money they're unlikely to be able to repay. Most of the sales people are so disgusted with what they have to do to make a living that they leave -- as do the customers, who soon drop out. Unless the government steps in to stop it, this Disloyalty Effect will continue to keep profits flowing into companies like Bridgepoint and the University of Phoenix. Couldn't we find something better to do with that $26.5 billion?